Oh New Year’s Eve ! 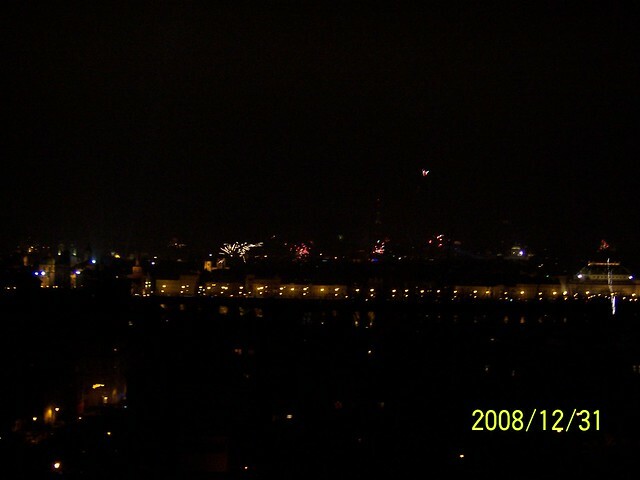 I was telling my friends that since I moved to Europe in 2008, one of the biggest cultural shifts for me was on how to celebrate the New Year’s. In the Philippines, it’s all about the family. As it’s a week difference from Christmas, I had mostly spent it with my family in our place. We light our fireworks and join in a potluck dinner together with our neighbors. It’s all about the karaoke, the lechon (suckling pig) and the amounts of noodles to consume (eating noodles was supposed to bring you long life). At home, I never spent New Year’s Eve with friends – it’s not that I don’t want to celebrate with them but rather they were also together celebrating with their own families. And in the four years I’ve been here, with the exception of last NY eve spent with my mom, the rest was spent partying in Prague, Brussels and this year in Macedonia. 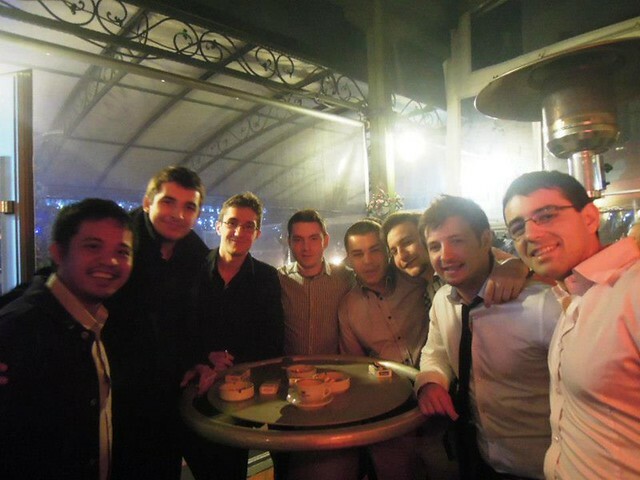 And my recent New Year’s Eve in Skopje was one for the books. My trip to Macedonia didn’t start well. I was supposed to be in Macedonia for a 10-day trip for both Christmas and New Year, but I got sick at the beginning of my holidays and I had to stay in Brussels for an extra week. And to add, I almost missed my flight after a long night out. But luckily, I managed to still squeeze in a 3-day trip to Skopje. I arrived in Skopje on the 30th of December and was welcomed by my Macedonian friend, Danco, and his family to their home with a dinner fitting the cliché “for a king”. After the big dinner, it was a bit of drinking and then off to rest. 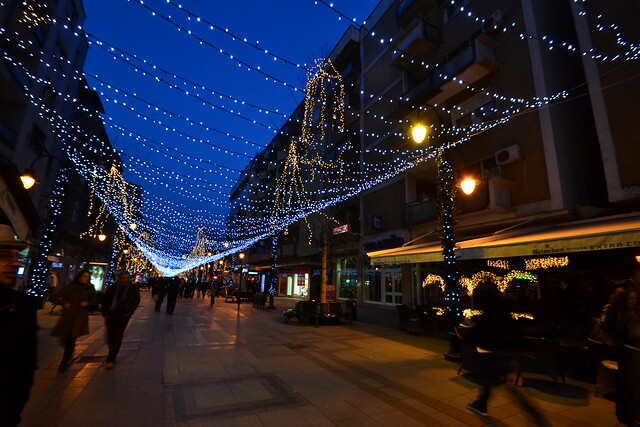 As I’m only there for a couple of days, we had an early start in the morning of New Year’s Eve, and have spent the entire day going around Skopje. But as the day turned into night, the preparations have set in. We got home, went for a short nap and started preparing for the long night ahead. The night started with some food and drinks at Danco’s place. 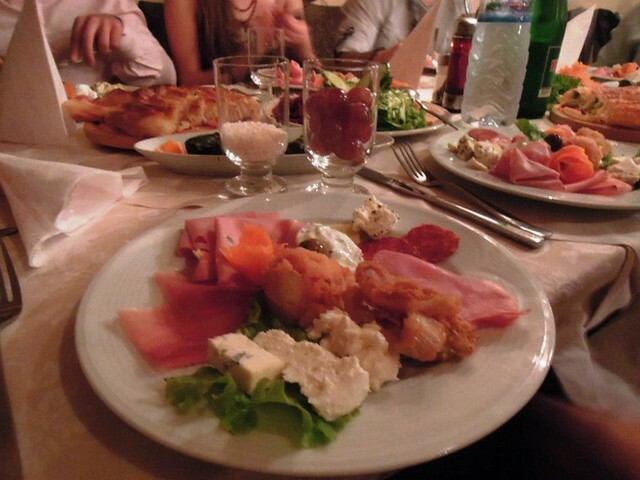 Together with his friends, we celebrated with food, wine and good share of Rakia – a staple liquor in the Balkans. The place erupted at around 10.30pm when they started playing traditional Macedonian dances. We danced the Oro, resembling a circle dance. As one of the only foreigner-looking guy in the crowd, definitely there was some attention drawn to my dancing (unfortunately, I wasn’t too good). It was criss-cross of dancing and eating – with a few involving dancing on top of the drums, and a lot of circling. And as one of the three Asians in the room, the DJ even played Gangnam style and of course, we became the star of the show. The night continued until the wee hours of the morning and after plenty of eating, drinking and dancing – at around 4am we called it a night. I like the fact that travel allowed me to discover new and fun ways to celebrate New Year’s. Looking forward to how I’ll celebrate it next year! What are your favourite New Year celebration moments? Do share them in the comment box below! How do you start a year? I’ve always seen the importance of making the beginning of the year a special one. My parents told me that the actions you do at the start of the year will be a sign on how your life will be for the year ahead. In the beginning of 2012, I was travelling in the streets of Paris with my mom. And 2012 continued to be a year filled with amazing travel memories. This year I was travelling again in Macedonia, visiting a friend in the capital city Skopje. It was this moment at Mount Vodno that made it for me. On the first day of January, even after a long night celebrating New Year’s Eve, we all agreed to have an early start and visit Mount Vodno, one of Skopje’s highest and most famous peaks. It’s a 40-minute drive up from the downtown Skopje to the base point of Vodno. From the base, there are several ways to go up to the peak. You can hike for two hours or drive up for another 30 minutes, but we took the most scenic way which is through a cable car. The cable car ride costs 100 Macedonian Dinar (roughly 2€) for a 5-minute ride up. 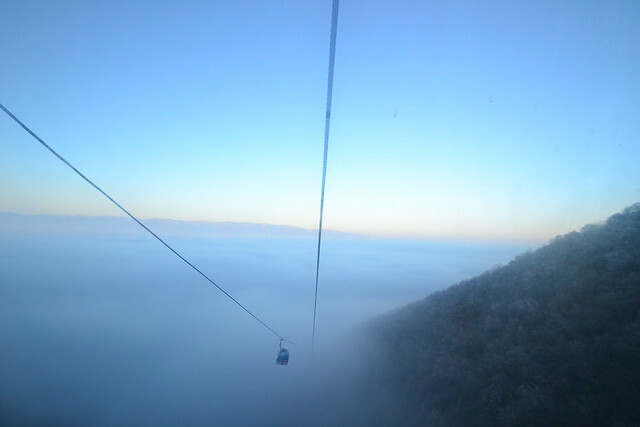 The cable car system opened a couple of years ago and was one of Skopje’s cultural and tourism development projects. As we ascend towards the peak, the clouds slowly started to blanket the view. The once brown mountainside turned to white, the trees gone. The feeling was surreal. 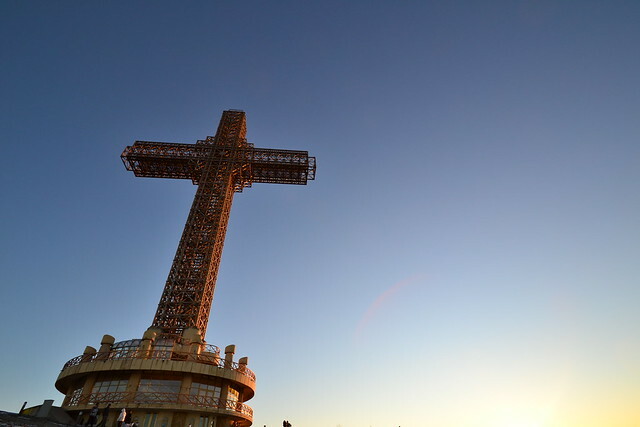 The first thing you see once you reach the peak is the towering Millennium Cross and is said to be biggest cross in Europe. 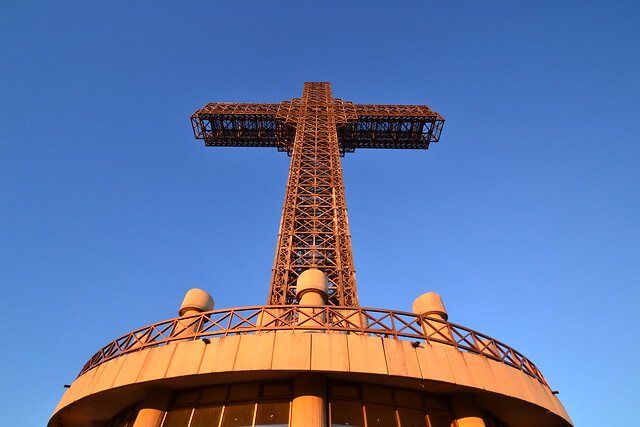 It was built in 2002 to celebrate the 2000th year since Jesus Christ’s birth. There was also a large Macedonian flag towers the sky and the ground. But it was mostly the view that got us. 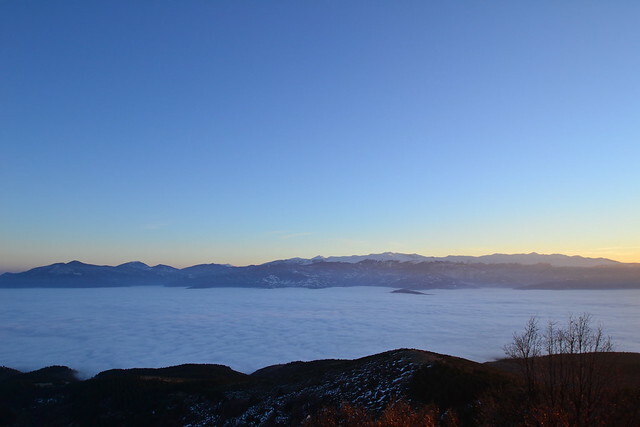 Standing at over 1000 meters, we were greeted with a blanket of clouds that covered the city view of Skopje and the surrounding towns. It’s a nice feeling, to be on top of the world and get that experience of as if you are in a storybook. 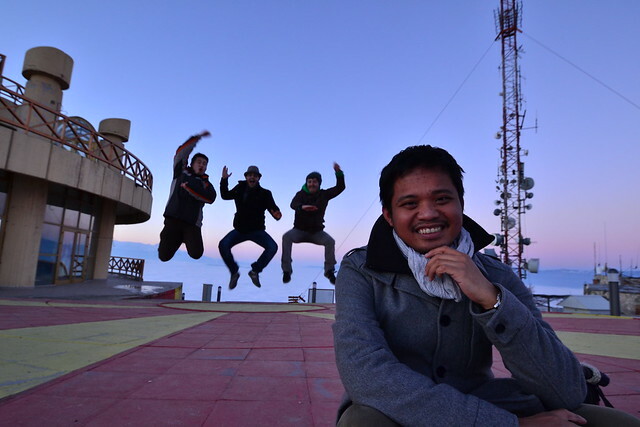 We spent most of the time taking photos, playing tourists with gangnam style jumping shots. I had time as well to reflect and just enjoy the scenery in front of me. We came back down to the base just as the sun was about to set. I’m lucky to have celebrated and traveled on New Year’s in several places across the world. I’m hoping that this year will be an even better year than the last and that travel will continue to play a strong part of the year. And I’m looking for more moments, literally and figuratively, of being high above the clouds.